“Who knows? In the next two or three years, we could be looking at one entity. 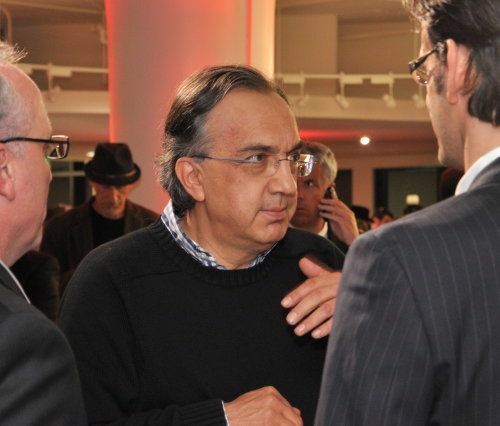 It could be based here,” said Marchionne while discussing the future of the cooperation between the two groups. Chrysler and Fiat currently do not share many features but it has been announced that the European Fiat Freemont will be based on the architecture of the Dodge Journey. There are also rumors that there will be a Jeep Grand Cherokee-based Maserati SUV coming at some point but the integration of the two begins later this month when the Fiat brand begins filling showrooms around the country. Fiat’s arrival into the US market is the first major step (other than the massive revamping of the Chrysler Group model lineup in the past few months) and as the two groups move forward, we can expect more platform sharing, along with more fuel efficient small engines with the help of Fiat’s European market experience. Dodge is expected to soon offer a small car based on Fiat architecture and there are the looming rumors that Fiat’s subsidiary Ferrari will have some input in the production of the next Dodge Viper but again, those are just rumors right now. The two companies are already sharing the Global Engine Alliance plant in Dundee, Michigan to produce the 1.4L engines in the new Fiat 500 and as more examples of platform sharing come to volition, we could see more compacts from Chrysler using the Fiat 4-cylinder engine. The main thing blocking Fiat and Chrysler from becoming more connected right now is the debt owed to the US government. Once the company has resolved that debt – possibly through an initial public offering which is frequently brought up in discussions with Marchionne – Fiat Auto and Chrysler Group could make more strides to become a single company. Fiat SpA current controls 25% of the Chrysler Group, although there are regular discussions about the Italian automaker acquiring more of Chrysler especially once Chrysler is ready to enter the IPO stages.